Landscape design is an art and a science and there are a number of elements and features that go into designing these areas. The plantings and masonry features are part and parcel of any landscape project and there are a number of other features that also add to the allure of these open spaces and water features are some of them. The minute you add a fountain or waterfall or even a pond or stream to the landscape, it creates a very serene and elegant ambience in the space. 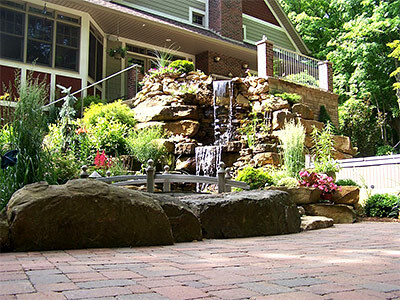 We at Mother Nature Landscaping are a full service company that has handled a number of small and large-scale water feature installation projects for customers in and around Bloomington, Martinsville, Mooresville, Bedford and Columbus. Over the years we have also catered to customers across Franklin, Seymour, Greencastle, Greenwood, Plainfield as well as Beech Grove. Most times these features are installed when the garden and yards are being installed; however, we also have many requests where homeowners want to install a rock waterfall or a bubbling boulder or some other water feature in their existing landscape and we do that too. We have been operating in this industry for 15 years and have the experience and skill to design unique features that will add to the beauty, functionality and value of your property. Waterfalls - These are very popular installations that create a very natural and alluring look in the landscaping. These could be made of concrete or natural stone and can be built either in a formal or casual design based on the architectural elements of your home and the styling of the rest of the features in the landscaping. If you like we can also connect the waterfall to a stream that flows through your landscape. Adding underwater lights brightens up the feature and adds to the beauty of your garden and yard. Fountains - Installing a stone fountain to your landscape can change the entire look of the outdoor space. The rest of the features there can be centered on the fountain and in most cases; it becomes the focal point of the landscaping. If you have a more spread-out garden space, you may want to consider adding another fountain to your garden and creating a small segregated area with seating around it. Since we provide custom fountain designs, you get a unique-looking feature that adds to the beauty of your garden. Ponds and Streams - These features are also extremely popular and we can design and build a pond you like. You can add aquatic plants and fish to the water and have underwater lighting ion it; this adds a very ethereal look to the installation. The streams that we build will be planned based on the layout of your yard or garden and it can be lined with river rock and lava rock of different colors. You can discuss your water feature project details with the specialists at Mother Nature Landscaping and we will provide solutions at very reasonable waterfall installation cost. The number to call is - 812-339-5296. You can also contact us via this online form or request for a free consultation and quote via this form.